The nutritional value of celery has baffled me. Celery always seems like one of the least nutritive vegetables. What I've discovered about celery, however...is pleasantly surprising. Except for the distinctive crunch of celery, celery has always seemed to reside in the nutritional background. It was what I considered a “quiet vegetable.” I never thought much of the nutrients in celery simply because I mistakenly believed that it did not have all that much. Whether you are a raw foodist or not, celery always seemed to appear on raw vegetable platters— and stay there— after the more vibrant vegetables were consumed. Celery nutrition is not as famous as some other vegetables, but maybe it should be. After doing some research into this “quiet vegetable,” celery's nutritional value both surprised and impressed me. Celery is a member of the apiaceae or umbelliferae family. Characteristic of plants in these families are aromatic plants with hollow stems. Some members of the celery family are highly poisonous so make sure you know what you are doing if you are wild harvesting. Other vegetables in this family include parsley and fennel. Most commonly eaten are the stems of celery. Sometimes the leaves, roots and seeds of the celery plants are also eaten. A “stick” of celery is a single stem of celery. Some celery recipes may actually require a whole bunch, or “head,” of celery. The array of vitamins in celery are impressive as are aspects of celery nutrition. Celery contains vitamins A, several of the B complex vitamins including vitamins B1, B2, B3, B5, B6, folate, vitamin C and vitamin K. The vitamins in celery are just a small part of the nutritional value of celery. The nutritional value of celery has made some, like the author of Juicing for Health, refer to celery juice as “magical” juice! 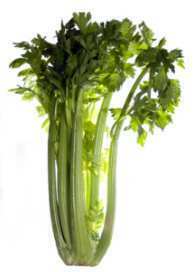 Alkaline Food - Celery is a very alkaline food. In helping to balance your body's pH and neutralize acid, your body can more easily fight infection. Arthritis - Celery seeds have been used as therapy for arthritis. These seeds are anti-inflammatory and reduce pain and swelling around joints. Blood Pressure- The nutritional value of celery has been valued in reducing high blood pressure. Celery contains a chemical that helps lower the stress hormones in your blood causing the blood vessels to expand and reduce your overall blood pressure. Gastrointestinal Health- The high fiber content of celery helps to maintain a healthy gastroinestinal tract and prevent constipation. Cancer- Celery contains at least eight anti-cancer compounds . Two of these anti-cancer compounds, acetylenics and phenolic acids, help stop the growth of cancer cells. Cholesterol- Celery increases bile acid secretion which helps remove harmful cholesterol and prevent plaque formation. Diabetes- The nutritional value of celery along with its absence of sugar, makes this an especially nutritious food for diabetic people. Hydration- The mineral and natural salts in celery make this a refreshing drink and will replace essential salts and minerals needed by the body, especially after workouts. Drinking celery juice will help prevent dehydration. Immune System- Celery contains specific antioxidants called “coumarins,” which boost white blood cell activity. These coumarins may also help fight cancer. Celery is rich in vitamin C, which also helps strengthens the immune system. Insomnia- The high levels of B vitamins and some of the many minerals found in celery helps nervous conditions, including insomnia. For a natural sleep aid, drink a glass of freshly squeezed celery juice mixed with a teaspoon of raw honey before going to bed. Joint Problems- Celery is anti-inflammatory. 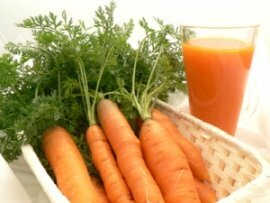 Its alkaline nature helps reduce pain and swelling around joints. Its diuretic properties help to remove uric acid crystals from joints. Kidney and Gall Stones- Celery and celery juice helps to dissolve and eliminate kidney and gall bladder stones and prevent them from forming. Weight Loss- Celery calories are so few, its fiber content is high and overall celery nutrition is great in making this an excellent food to fit any diet. The nutritional value of celery is so great that it will feed your entire body. Eating celery and drinking celery juice will help curb sugar cravings. There is much to be said about the nutritional value of celery. Celery can lower blood pressure, sometimes too well. In a few people, celery can make their blood pressure lower than desired. Pregnant women may want to avoid eating celery seeds since celery seeds may cause uterine contractions. Consult with your physician first. Clean the celery sticks and carrots. Place them and the lemon in a juicer and juice. Mix and enjoy! Finished with Nutritional Value of Celery? Go from Nutritional Value of Celery to HOME of Raw Food Diet Magazine.